Growth and development have been no stranger to the city of El Paso in recent years. With construction expansions, political races and so much more being planned out, 2018 could be a monumental year in the city’s evolution. 1. O’Rourke vs. Cruz: Who will Texas vote for? Beto O’Rourke, the El Paso native, is Texas Democratic Party’s big hope to unseat Ted Cruz in the 2018 U.S. senate race. 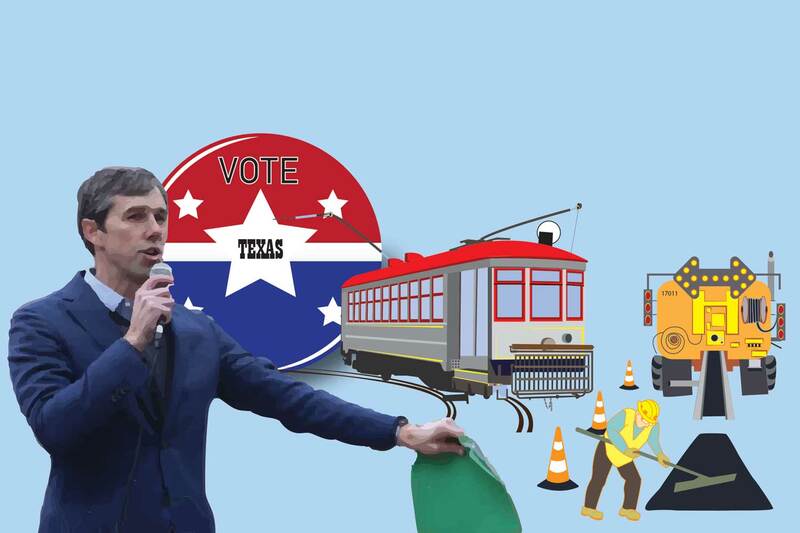 O’Rourke will endure his biggest challenge yet against Cruz. The Tea Party icon has been senator since winning in 2012. Cruz, who also tested Donald Trump in the 2016 presidential election, could see a reflection of his success following the results of this race. “Tonight, the eyes of the nation were on Alabama. Tomorrow, Texas and 2018,” O’Rourke told thousands of email subscribers and donors after Alabama’s Republican-nominee Roy Moore lost the senate race to Democrat Doug Jones. O’Rourke prides himself on a grassroots campaign and does not accept corporate donors to fund his campaign. His areas of political preferences include immigration reform, giving back a voice to smaller communities across Texas and his opposition to the war on drugs. Nonetheless, come Nov. 6, we will know whether Texas has swayed toward the left or if it will reign red. The El Paso Streetcar plan broke ground in 2017, ripping up streets throughout the downtown and UTEP area to place tracks and rail lines. Upon completion, the streetcar will travel on a five-mile route from south El Paso, through downtown to the UTEP campus. The team’s focus is on utility relocation, developing a storage facility, repairing sidewalks, placing the rails, planning 27 stops and resurfacing streets. The route has two separate loops. Its Downtown Loop will run along Santa Fe Street, Franklin Avenue, Kansas Street and Father Rahm Avenue, while the Uptown Loop will go on Franklin Avenue, Stanton Street, Baltimore Drive, Glory Road and Oregon Street, according to the site’s website. It will connect the international bridges, retail areas, government buildings, convention center and Chihuahuas’ stadium with the UTEP area and historic neighborhoods. Sun Metro is awaiting the streetcars, which are being restored in Pennsylvania. The company hopes to have its first cars running by the end of the year, possibly even in the fall. After a contentious 2017 year with the proposed $280 million downtown arena, historical preservation members and residents of the Duranguito area were able to come out with a huge victory by getting a partial ruling in their favor, when a Travis County judge ruled the arena could not hold sporting events. It was the first time in recent Texas history that a city lost on a voter bond case. The El Paso Times reported in December that the city had spent around $2 million in legal fees so far. After the Travis County ruling, the city also decided they would appeal it in front of a three-judge panel in the Third Court of Appeals in Austin. Through litigation, both sides will argue about land purchasing agreements, dispute over judge Amy Clark Meachum’s ruling and ultimately decide on what the guidelines will be for the proposed arena. Since both sides were very firm during the initial ruling, the parties might find an answer through mediation and compromise, as they have alluded to. No hearing or mediation has been set for the 2018 year, and could even go into 2019. 4. Escobar, Fenenbock, or other candidates: Who will replace O’Rourke in the 16th Congressional District? As O’Rourke leaves to challenge Cruz for his senate seat, the 16th Congressional District will see its newest seat holder for the first time since 2012. The candidates include former El Paso County Judge Veronica Escobar, former El Paso Independent School District board President Dori Fenenbock and former state Rep. Norma Chavez. On the other hand, Fenenbock has been supported by the wing of the Democratic Party in El Paso that supported former Congressmen Silvestre Reyes during his tenure. Other Democrats who have tossed their name into the race have been John Carrillo, Enrique Garcia and Jerome Tilghman. Republicans who have joined the race include Alia Garcia-Ureste and Rick Seeberger. The primary elections will be held on March 6, while the general election will take place on Nov. 6. Throughout 2018, El Paso drivers are expected to endure one of the worst years for road construction. TxDOT engineers and project managers have said that particularly the west side of town will face high levels of traffic congestion as part of the $158 million GO-10 Project, which hopes to finalize its development by 2019. Specifically, the Sunland Park overpass will be the target area that will be most affected, since work crews will have to demolish the entrance ramp to 1-10 East. This part will take about three months to finish and could cause the majority of traffic congestion to the west side of town. Along with the Sunland Park fly-over ramp that will be demolished, major areas of improvement will include the I-10 at Sunland overpass extension and the I-10 Executive Center ramp replacement. When the project is complete, the entire city will connect through Loop 375. TxDOT is also currently in its final stages of completing construction on Paisano. This year, UTEP’s new Interdisciplinary Research Building will continue its construction as the school’s newest building. The project broke ground in November and will go with a more modern design, like the Undergraduate Learning Center. The new research facility hopes to grow the school’s research and training enterprise. The $85 million building was authorized by the Texas Legislature last year, and Burges and Barry Halls were demolished to make space for the building. The building plans to be occupied by interdisciplinary programs and teams from multiple colleges, per President Diana Natalicio. For more information, visit the building’s website at www.idrb.utep.edu.